Low blood pressure usually occurs as a result of dehydration following loss of large amounts of fluid or salts from the body, e.g. heavy sweating, loss of blood, or profuse diarrhoea. Hypotension may also be caused by disorders that reduce the heart's ability to pump blood, such as heart failure, or heart attack (myocardial infraction), or irregular heart beat (arrhythmias). Abnormal widening of the blood vessels as a result of an infection of the bloodstream (septicaemia) or a severe allergic reaction (anaphylaxis) can also cause hypotension. Seek medical treatment. If caused by dehydration your doctor may need treatment with intravenous fluids. If your doctor suspects an underlying disorder such as a heart condition, you may be admitted to hospital for tests and treatment. If medication is causing hypotension, your doctor will probably advise a change of drug or dosage. Hypertension is persistent high blood pressure that may damage the arteries of the heart. If left untreated hypertension can result in damage to the eyes, kidneys and other delicate tissues. The higher the blood pressure, the greater the risk of heart attack, coronary heart disease and stroke. However usually the only symptoms that develop are those due to the damage caused by hypertension. By this time, irreversible damage to arteries and organs has occurred.The first indication may be a fatal stroke or heart attack without warning. In 9 out of 10 people there is no obvious cause for the condition. However both lifestyle and genetic factors may contribute. The condition is most common in middle aged and elderly people because the arteries become rigid with age. Although hypertension occurs most in developed countries, it is now a significant problem in the developing world. The condition is rare in countries where people typically have a low salt diet, suggesting that salt may be a contributing factor. Hypertension in pregnant women can lead to the development of potentially life threatening conditions pre-eclampsia and eclampsia (high blood pressure, fluid retention & protein in the urine in pregnancy which may lead to seizures & coma). The elevated blood pressure usually returns to normal after birth. Blood pressure measurement is a routine part of having a physical examination. A measuring device called a sphygmomanometer gives a blood pressure reading is systolic pressure (the higher figure) when the heart contracts and diastolic pressure when the heart relaxes. Your blood pressure should be taken when you are sitting or lying down. 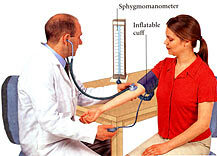 An inflatable cuff is wrapped around your upper arm and inflated using a bulb. The cuff is slowly deflated while the doctor listens to the blood flow through an artery in your arm using a stethoscope. Blood pressure is shown by the height of a column of mercury (in units of mmHg). If your blood pressure is higher than 140/90 mmHg your doctor may ask you to return in a few days so it can be checked again. The White Coat Syndrome: Some individuals become anxious when they visit their doctor, which may cause a temporary rise in blood pressure. It is suggested you should have your blood pressure taken at least twice on each visit as invariably the second reading will be lower than the first. A diagnosis of hypertension is usually not made unless you have elevated blood pressure on three separate occasions. The American Medical Association is going after the American Government and the food industry to reduce what it sees as a persistently high level of salt in many processed foods. In its annual meeting late June 2006, the Medical Association, which had never before called for regulation of a food ingredient, recommended that the Food and Drug Administration limit the amount of salt that food companies are allowed to add to products. The National Academy of Sciences' Institute of Medicine said it had been known for at least 2 decades that salt-induced high blood pressure is a significant contributor to heart disease and stroke, the Nº 1 and Nº 3 causes of death in the United States. (Cancer ranks second). The US Governments dietary guidelines say that the average young adult should eat less than 2,300 milligrams of sodium a day. The threshold for people with high blood pressure should be 1,500 milligrams. A nerve wracking job or a nasty boss may make life miserable, but a review of studies by Dr Samuel J Mann, professor at Weill Medical College of Cornell University, has discovered that only a minority of reports found any association between job stress and high blood pressure. "There is no doubt that stress raises blood pressure transiently (for a short time)" Dr Mann said. "But also most everybody has the misconception that stress causes high blood pressure, but we have not been able to prove that despite 50 years of research." People who regularly consume low-fat dairy products may be less likely to develop hypertension, researchers have found. Researchers from The National Heart, Lung and Blood Institute looked at the eating habits of almost 5,000 people taking part in a heart study and found that those who took in two or more servings of low-fat foods like milk, cheese and yogurt tended to have lower blood pressure. "These findings lend support to the recommendation of low-fat dairy consumption as a mean to lower blood pressure," wrote the researchers, who were led by Dr Luc Djousse of Harvard Medical School. Hypertension cannot be cured but can be controlled with treatment. If you have mild hypertension, changing your lifestyle is often the most the most effective way of lowering your blood pressure. You should reduce your salt and alcohol intake. Even reducing your weight by 5 kg can have a positive effect. If self help measures are not effective in reducing your blood pressure, your doctor may prescribe anti-hypertensive drugs. You may be prescribed just one drug or a combination of several. The type of drug and the dosage should be tailored to the individual. • Start an exercise program. Obtain a medical clearance before starting. • The exercise program should be gradual, regular and aerobic in nature (walking/cycling). Start by walking 5 days a week for 10-20 minutes. • Give up smoking (or at least cut down). Giving up smoking has been shown to be the one of the greatest single factors in improving your health fast. • Eliminate salt from your diet. As salt travels through your body it draws fluid out of the blood vessels, which in turn increases your blood pressure. • Avoid isometric exercises. These are exercises where you exert force against an immovable object, i.e. trying to lift something really heavy. You generally hold your breath whilst doing this, and that will make your blood pressure skyrocket. • If you are overweight, endeavour to loose at least 5 kg initially. What may be done ? Workplace: High blood pressure ?